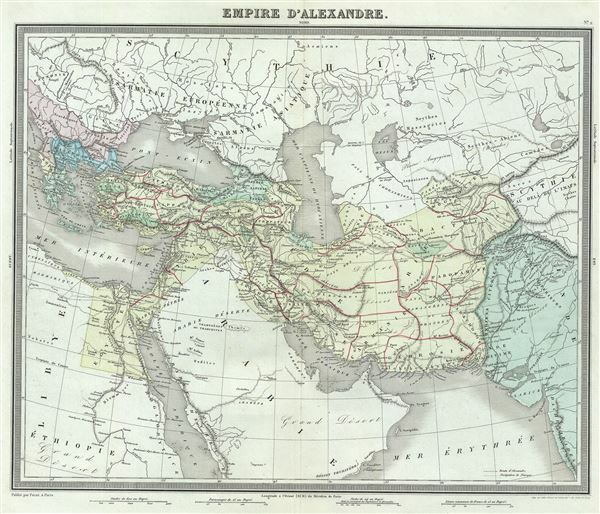 This is a beautiful 1874 map of the Empire of Alexander the Great by Ambroise Tardieu. It covers from Alexander's homeland in Macedonia eastwards past Asia Minor and Persia as far as India and south to include Egypt. Both the Caspian Sea and the Black Sea are included. Throughout, the map identifies various cities, towns, rivers and assortment of additional topographical details. Tardieu created this map to illustrate the conquests of the Macedonian King Alexander III, called ‘the Great,' conqueror of the Persian empire and at just thirty, ruler of one of the largest Empires in history. Alexander the Great was undefeated in battle and is considered one of the most successful military commanders of all time. The map also notes the route for the march of Alexander, inland through Gedrosia. Alexander lost a huge number of soldiers and supplies during this march through the desert. This map was prepared by Ambroise Tardieu and issued as plate no. 2 in his 1874 edition of Atlas Universel de Geographie Ancienne et Moderne.